The landscape design flowchart below is a pictorial description of the entire process. As you can see, the process starts with an objective statement that has a quantifiable goal (e.g., population response, energy use, etc.). PLJV strongly believes that population goals to direct conservation action are a key component of landscape design. Scientific literature states that conservation planning in the absence of a well-articulated goal will not yield a plan that provides answers (Game et al. 2012). Instead the result is an amorphous plan with little or no direction towards achieving a goal. As part of PLJV’s landscape design process, we will continue to take the population goals stated in the four continental bird plans, step them down regionally and develop habitat conservation plans to support these regional population goals. 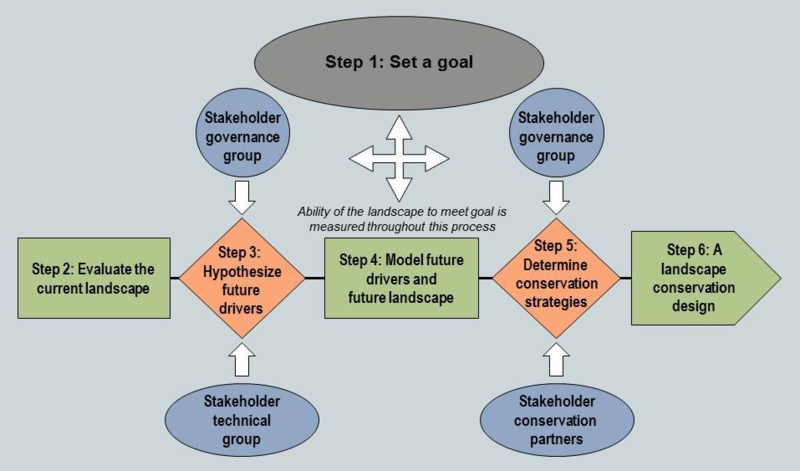 At every step in the process, the landscape patterns should be related back to the goal so that the partnership can understand how current and future patterns do/will impact the goal and how conservation programs can help achieve the goal. The PLJV Hierarchical All-Bird Conservation System (HABS) database was created to determine the current carrying capacity of the PLJV landscape for birds. Goals may be aspirational or achievable, regardless, they should be measurable or quantifiable. This step includes mapping of the conservation estate and impervious surfaces where restoration actions may be difficult if not impossible. This step includes spatial models that can help illustrate disturbance patterns (e.g. crop suitability models can illustrate why current row-crop patterns are seen on the landscape). Also included is understanding the social, economic, and cultural values of the area in question through formal Human Dimensions science or informally (e.g., set of questions for partners to ask landowners). This is when the partnership hypothesizes which drivers are likely to be most important for impacting future patterns and processes. In this step, it is tempting to make an exhaustive list of everything that could possibly happen in the landscape in the near or distant future. However, a complete list of every possible “what-if” scenario will only make matters more confusing. Instead, this should be a hypothesis generating step, with potential drivers that may shape the future landscape determined by reasonable extrapolation from current knowledge (e.g., climate change models or industry predictions on expansion of oil and gas development). The results are reviewed for their biological and sociological reality and then for their ability to guide future conservation actions. Once the models are developed to represent current and future patterns and processes and the human dimensions science is collected, the partnership comes together to determine conservation strategies. These discussions should set direction on the actions to be taken and policies that need to be implemented or changed and target where specific programs will have the most benefit. The result is a landscape design with specific actions to implement that will achieve the stated goals. Finally, the landscape conservation design is implemented by the partnership. There should be a firm commitment by the partnership to implement the strategies outlined in the process.